The first sample of a tactical unmanned multipurpose vehicle “Fantom” was represented to the Secretary of the National Security and Defense Council of Ukraine Olexander Turchynov. “Fantom” is a remotely operated mini armored carrier. Day and night sighting systems allow to fire at any time of the day for a distance of over 1 km. Its operational range is up to 20 km, it is operated by means of secure radio channel or via fiber cable of 5 km length. “Fantom” can transport ammunition, retrieve wounded from the battlefield and perform combat missions. “Fantom” is a first testing project of the SE "SpetsTechnoExport" developed and implemented with support from the “Innovations Development Platform”. 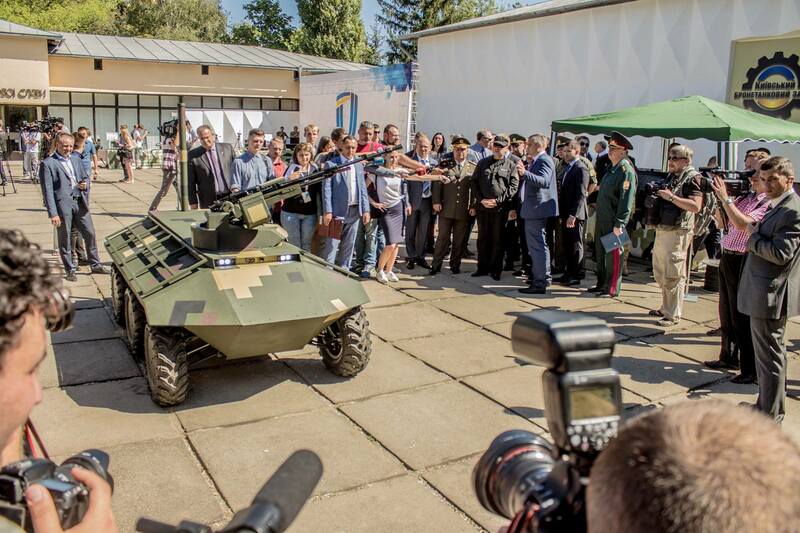 Pavlo Barbul Director of the SE "SpetsTechnoExport"
As soon as all tests of “Fantom” are successfully completed and all technical documentation is produced, developers are planning to start a serial production of unmanned ground platforms in different modifications.